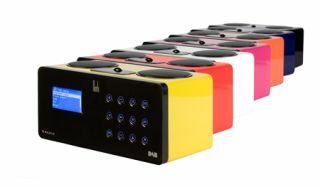 UPDATE: Roth £199 table-top DAB/FM/web radio adds a splash of colour | What Hi-Fi? From October, the Roth KRadio will be available in a choice of six new colours, in addition to the original black version. Roth says the black model will be in the shops next week, with the new colour versions – at the same price of £199 – arriving in October. The new colours are yellow, red, white, blue, orange and pink. The latest product from British company Roth AV is its first standalone radio, the KRadio. The new £199 model has DAB, FM and internet radio tuners, as well as a built-in dock for iPods and iPhones, and is operated using either the remote handset supplied or touch-motion controls on the unit itself. It's built around the latest V6.2 module from Frontier Silicon, offers ten presets each on internet radio, DAB and FM, and delivers 2x5W through its top-mounted speakers. There are twin alarms, able to wake the user with audio from any of the radio tuners, or from a docked iPod or iPhone, and the unit will also charge the battery of the docked device. Internet connection is via wired Ethernet or Wi-Fi. James Roth says that “This is our first foray into the DAB/Internet radio market-sector and we believe we have designed a product that meets and exceeds the requirements of our customers. The no-touch motion-sensing controls should mean the high-gloss black finish is kept free from fingerprints, and the company plans to add more colours in the future. The KRadio hits the shops in September.